does anybody has same problem or experince ? 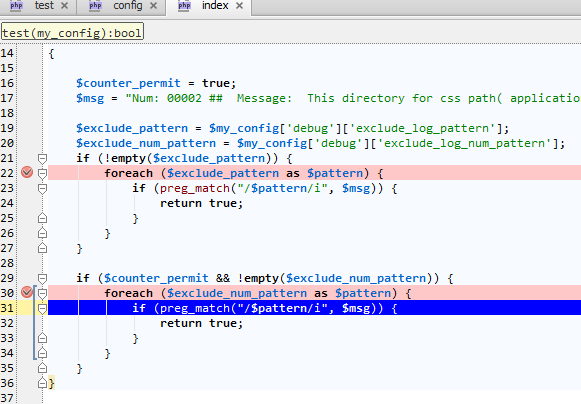 IDE will not stop (rather, xdebug will not issue breakpoint) on certain lines (like, on foreach line). Please extract your code (you can alter it as you wish) into separate file (project) to make reproducible code example so it can be used for testing by devs. I've tred to reproduce the issue with my simple code and my solution worked for me (no idea if you have tried my code or not). Maybe your case is different -- I have no code and cannot verify it. Also -- what xdebug version do you use? Try updating to the latest version (2.2.2 is the latest one; 2.2.1 works for sure). Please attach your file to the forum post. The site where you have uploaded it asks for registration and I have no plans to register on some site just to download some random file. So ... from this example -- which foreach (I mean -- which breakpoint) does not work: first or second? (Notice that I have added curly braces to both if/cycles). should i put bracks for all codes before it ? The breakpoint on second foreach works (after adding curly braces, of course) -- I can step inside it (current execution line has blue background).